The latest IMWG consensus criteria for response and minimal residual disease (MRD) assessment in MM include a stringent complete response (sCR) category, which requires normalisation of a sFLC ratio in addition to other criteria (Sections 18.2.2 and 25.3.5). Kapoor et al. reported the largest study of the prognostic value of a sCR in 445 patients who underwent an autologous stem cell transplant (ASCT) within 12 months of MM diagnosis. Five-year overall survival (OS) for patients with a sCR (n=109), conventional CR (n=37) and “near CR” (nCR; n=91) was 80%, 53% and 47% respectively. Progression-free survival (PFS) and OS curves are shown in Figure 20.5 A and B. It was also observed that OS was superior in patients who maintained their sCR status for at least 6 months compared to those who had a sCR which was maintained for less than 6 months (Figure 20.5). The authors concluded that myeloma trials reporting response rates should identify those achieving sCR and conventional CR separately owing to their markedly disparate outcomes. Other studies have also reported a prognostic benefit of sFLC ratio normalisation in patients who achieve a CR . Conflicting data on the prognostic value of the κ/λ sFLC ratio at CR have been reported. For example, Jiménez Ubieto et al. reported no survival benefit of κ/λ sFLC ratio normalisation in 203 MM patients who achieved a CR in Spanish PETHEMA clinical trials. Similar findings were reported by others . Pratt et al. discuss a possible explanation for why these observations are contradictory to the findings of Kapoor et al. The Spanish group analysed a smaller population of patients in ≥CR (n=94) and utilised EBMT criteria, whereas Kapoor et al. analysed a large cohort (n=445) using IMWG response criteria. Given that a CR according to EBMT is stricter than IMWG (IFE negativity must be sustained for at least 6 weeks), this may explain why outcomes for patients in CR versus sCR were similar in the Spanish study. Several studies suggest a prognostic role of sFLC ratio normalisation in IMWG response categories other than CR. Iwama et al. reported that sFLC ratio normalization identified patients with improved OS and PFS whether they had achieved a conventional CR, a very good partial response (VGPR) or a partial response (PR) (n=126; p<0.001). Similar results were reported by Tacchetti et al. , Matsue et al. and Yagci et al. . However, these studies did not look at patients with LCMM or IIMM separately. In a study of LCMM patients only  (n=122), those who normalised both their κ/λ sFLC ratio and iFLC values had significantly longer PFS and OS compared to patients that normalised their ratio only. Both these groups had better survival than those failing to normalise either parameters (median PFS: 43.3, 33.0 vs. 18.8 months, respectively [p<0.001]; median OS: 85.3, 69.9 vs. 45.5 months, respectively [p=0.012]). Similar findings were reported by others . Dejoie et al. confirmed the prognostic utility of sFLC measurements in LCMM, both in early responders (after 3 treatment cycles) as well as in those patients whose sFLC parameters normalise later during monitoring. Importantly, all patients whose sFLC ratio normalised after 1 or 3 cycles went on to achieve MRD negativity by flow cytometry. The study also compared the prognostic value of the serum vs. urine FLC response, which is discussed further in Section 24.8. Moustafa et al. studied the prognostic significance of normalisation of the κ/λ sFLC ratio in IIMM patients with residual monoclonal intact immunoglobulin at the time of maximal response. The study included 449 newly diagnosed IIMM patients who achieved less than a CR at the time of first best response following therapy. Normalisation of the sFLC ratio was seen in 34% of patients, and was associated with a longer PFS and OS compared to that of patients with an abnormal sFLC ratio (PFS: 29 vs. 16 months, p<0.001; OS: 91 vs. 58 months, p<0.001). In a multivariate model, normalisation of the sFLC ratio remained prognostic, and the authors concluded that their findings support the inclusion of sFLC analysis in all levels of response criteria. 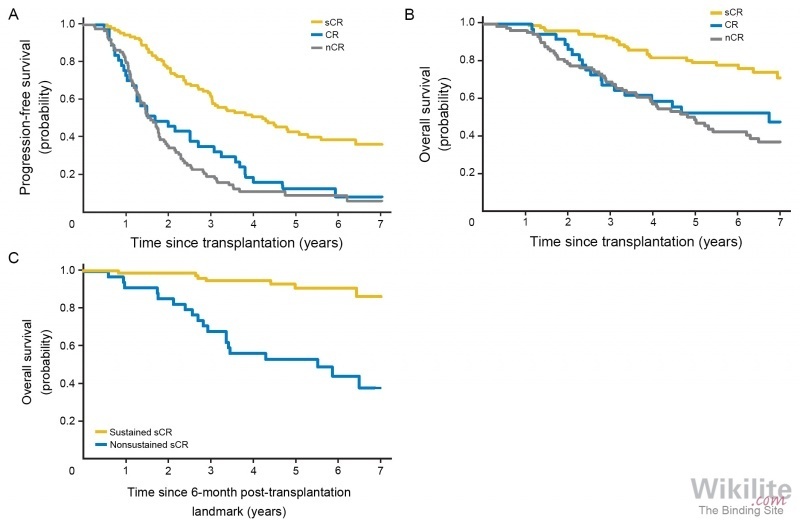 Similar findings were reported by Abe et al. .
An alternative prognostic use of sFLC analysis was made by Singh and colleagues  who monitored the uFLC concentration in patients after reduced–intensity allogeneic transplant. Both uFLC and iFLC concentrations were suppressed immediately after transplant, and the patients (n=47) were divided into 3 groups according to whether their uFLC concentrations failed to recover, recovered early or recovered late. PFS was significantly longer in the late uFLC recovery group (median PFS not reached at 5 years vs. 11.8 months for early recovery and 4.6 months for no recovery; p=0.0001). The authors concluded that late uFLC recovery might indicate better graft versus MM effect and that monitoring uFLC may help in managing immune suppression strategies. In addition to the sCR category, IMWG consensus criteria define MRD responses, based on flow cytometry, gene sequencing and imaging, for patients who have achieved a CR. Pratt et al. propose that studies are designed to evaluate the best strategy to integrate these tests into routine practice. For example, sFLC analysis may prove useful to guide when MRD assessment is required; costly and invasive bone marrow biopsies could be restricted to patients with normal serum results.